It's a mystery how cleaner shrimp partner with would-be fish predators—sometimes even climbing in their mouths—without getting eaten. A new study reveals how the shrimp convinces fish not to eat them, and the fish conveys that it's a friend and not a foe. The secret, Duke University researchers say, is truth in advertising. The cleaner shrimp Ancylomenes pedersoni lives on coral reefs in the Caribbean Sea. There, three to five shrimp set up shop at a "cleaning station" where they pick parasites and dead skin off the mouth, gills and scales of passing fish such as blue tangs, parrotfish and snappers. Both parties benefit: The shrimp get a nice meal, and the fish get a good scouring. "They're like the dental hygienists of the reef," said first author Eleanor Caves, a postdoctoral researcher at Duke University. Many of these fish would normally eat crustaceans—such as shrimp—but in a show of restraint, the fish don't eat the shrimp that rid them of pests. "It's not that the shrimp are poisonous or distasteful," said Caves, who offered chopped up cleaner shrimp to reef fish, and watched them happily eat it up. To watch the interaction between shrimp and fish, Caves and colleagues placed GoPro cameras at 10 cleaning stations on the coral reefs off the Caribbean island of Curaçao, and left them for several hours. The researchers recorded and analyzed 199 encounters involving 18 shrimp and 10 fish species, they report June 20 in the Proceedings of the Royal Society B. 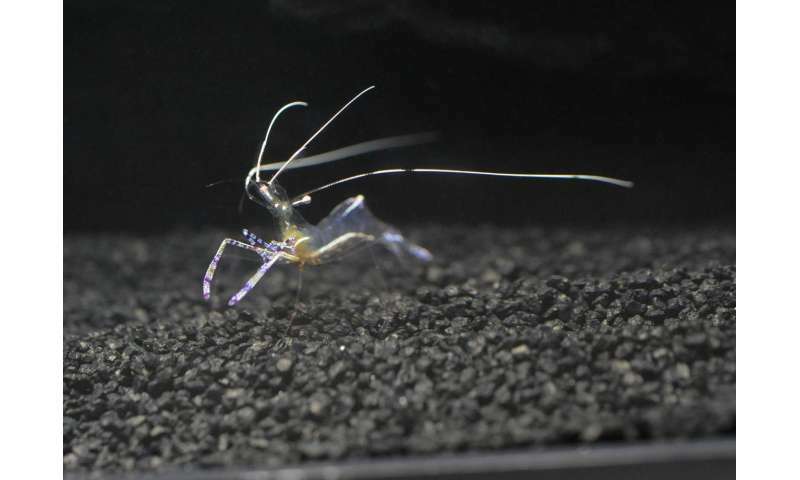 What they saw was that when a fish approached a cleaning station, the shrimp waved their long white antennae—a move researchers suspect conveys a willingness to clean. Eighty percent of the time, when a cleaner shrimp waved, it held up its end of the bargain and ended up cleaning. The team found that when shrimp do not wave their antennae, they are much less likely to clean. But the fish improve their chances of getting the shrimp to play along by quickly changing color from light to dark. The fish turned dark before shrimp even touched them, suggesting that color change is more than a physiological response to being picked, Caves said. It's their signal that they want to get cleaned, and aren't just trying to pull a fast one. In a laboratory experiment, the researchers found they could show cleaner shrimp images of fake fish consisting of circles and other simple shapes on an iPad screen propped against their tank, and the shrimp still acted like it was the real thing. The shrimp were more likely to try to clean dark-colored shapes over light ones, but just seeing a dark rectangular blob was enough to make a shrimp wave its antennae, approach and tap the shape behind the glass or attempt to hop on—even with no real fish in the water. The findings suggest that shrimp don't just wave their antennae to sniff the water for potential customers, as some researchers have suggested. It's a visual signal. "They're advertising their services," Caves said. Either party's signal kicks off their carefully choreographed exchange, the researchers found. Both shrimp that waved their antennae and fish that changed color cooperated as promised. But negotiations fell through and cleaning never occurred when both parties strayed from their tried-and-true script. The researchers also created a series of videos showing what these signals might look like through each animal's eyes, using a software package they developed called AcuityView. The modified videos confirm that shrimp, though they can't see colors, can still detect the fish's change from light to dark. And while the shrimp's long, white, waving antennae are a blur to their fellow shrimp, even up close, they're perfectly visible to reef fish, some of which can make them out from more than a foot away.